You’ve got to love Beetlejuice. He’s funny, cheeky and forever trying to take advantage of the newly dead. Beetlejuice has longevity, we’ll give him that; he still rates as one of the most popular Halloween characters for both men and women. To emulate Beetlejuice convincingly, you’ll need undead, ghoulish makeup. In this case it’s an affronting combination of a white base with green splatters, purplish-black ringed eyes and crazy, backcombed white hair with highlights of black, green or purple. Check out this tutorial for an uncanny metamorphosis. Beetlejuice wouldn’t be Beetlejuice without the trademark black and white striped suit with a white shirt and black tie. The ladies might want to wear and black and white striped dress and white knee-high socks. Not a bad look for someone long dead! Batman aficionados will love these costumes; the latest movie has inspired a whole generation of fans, and rightly so! 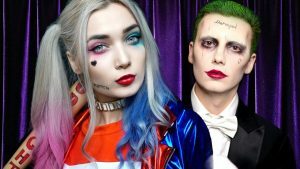 The Joker and Harley Quinn make for a fascinating pair whose love was sparked in a lunatic asylum how romantic?! Spending a night as the Suicide Squad’s formidable duo promises to be a fun and memorable experience from start to finish. We love Margo Robbie as Harley Quinn; she is one tough cookie with a heart of gold! Likewise, Jared Let’s reincarnation of the Joker is as evil as he is charming. Both looks are simple enough to achieve. Harley’s look is long bleached locks dipped in pink/purple, with saucy blue and red attire and vampish makeup; the Joker is famous for his green hair, white face, garish red slash of a grin, and blackened eyes and teeth. This awesome two in one makeup tutorial shows you how to transform yourself into both the Joker and Harley. Jigsaw is one puppet that is – quite frankly – terrifying! As if that ugly mask wasn’t enough on its own, anyone who has seen the Saw films knows that his ability to incite fear also lies in his ruthless reputation. It’s hard to imagine things more evil than the acts this grotesque creature carried out, which is why Jigsaw makes such a plausible Halloween character. Your neighbourhood will be on edge with you skulking about in this get up – which is all the more reason you’ll want to do it! 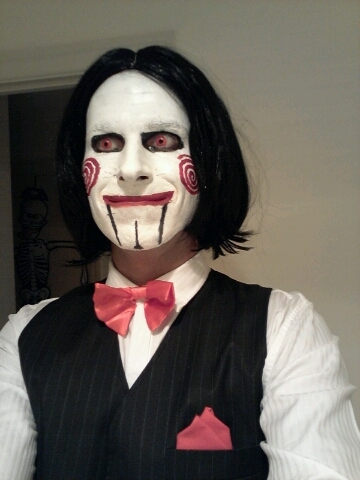 Jigsaw’s look is pretty easy to recreate. All you need is black, white and red face paints for this simple but dramatic look. If you want to go all out, build up your cheeks and chin with latex to perfect that sharp, jutting look. Pop in some red contact lenses and your makeup is sorted. For the outfit, a black suit and a red bowtie makes for a creepily incongruous finish. 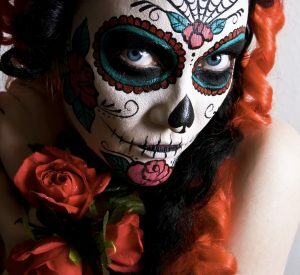 Day of the Dead is great for those who love to be equal parts beautiful and scary. The intricate details of this look contribute hugely to your impact at Halloween – or any other time of year. Short, frilly and ruffled black dresses really look the part, as do bodices and fishnets. Hair can be covered with veils, or arranged with roses – or hats adorned with roses. Roses around the neckline also look great. The makeup is all about skulls, flowers and patterns. Although this is one of the most decorative makeup applications, it is well suited to those who like to paint in detail. Starting with a white base, a black kohl eyeliner works well for such details, with plenty of colourful makeup to fill in the gaps. This looks is incredibly effective and pretty. If you don’t have the time or inclination to paint it on, grab a DOD tattoo sticker to do it quickly. This video gives great tips on applying jewels and a wig with roses to finish off the look. 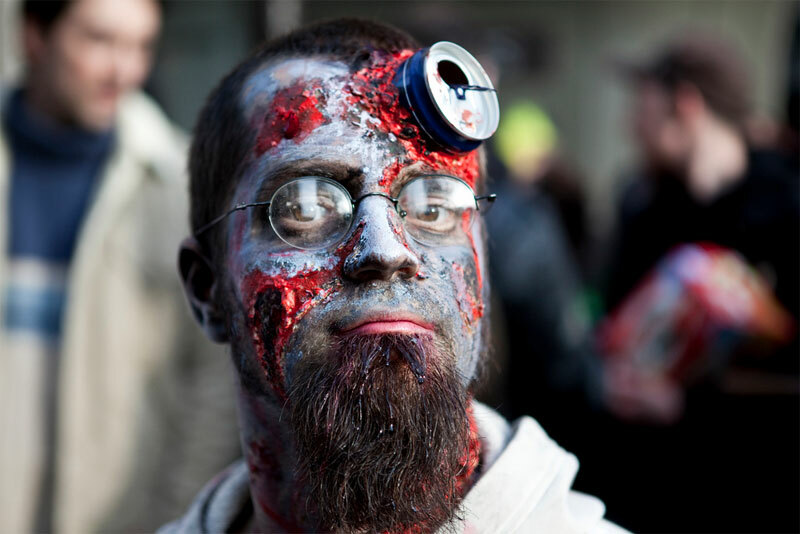 Zombies are an integral part of any Halloween celebration. An annual zombie apocalypse never hurt anyone (off screen, anyway) and zombies continue to walk the world’s streets at Halloween in increasing numbers. If your main goal is to scare the living daylights out of people, you can’t go wrong with the traditional zombie look. If you want to improvise a little, mix and match looks like the one in this barbie zombie video. Even if Barbie leaves you cold, the techniques work for any zombie. Start with a made up face and then add latex, tissues and some dark brown/black makeup. Finish off with some dripping blood. Easy! What is it about clowns? 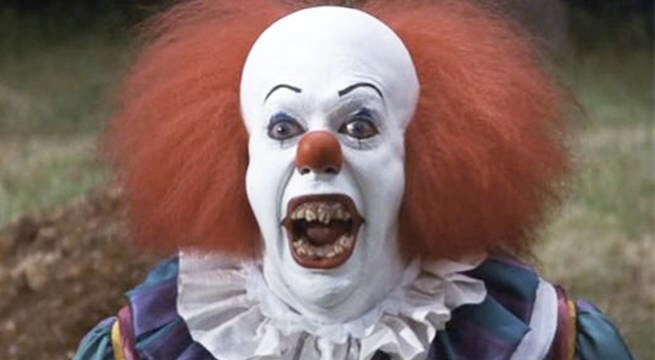 Stephen King really raised the bar with his terrifying clown in his film IT, but even before he did that, people had a healthy fear of these strange circus creatures! Now that King’s new movie is looming in the distance, clown-fearers are breaking into fresh cold sweats. 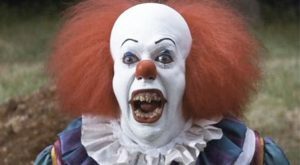 As the clown remains one of the scariest Halloween costumes around today, the timing couldn’t be better to embody Stephen King’s IT clown for a night. The red shock of hair contrasts with the ghostly white face and the traditional red nose. The look is set off by shudder-invoking rotten teeth or fangs. Even this makeup tutorial is creepy! But brace yourself, as it contains all you need to know to perfect the look. Chucky is probably the creepiest, angriest doll ever created. You wouldn’t want to meet him down a dark alley that’s for sure and that’s what makes him the perfect Halloween character for those who prioritise both easy makeup and orchestrating nightmares. There’s nothing pretty about chucky, so prepared to go all out ugly with your makeup. First up, you’ll either need a rust coloured pudding bowl or bobbed wig, or some orange spray for your own hair as per this tutorial (it’s in German but the demo speaks for itself). For the makeup, a network of scars and hollow eye sockets is all you need. Throw a menacing scowl into the mix and you’re done. Chucky’s iconic outfit is the childlike dungarees and stripy long sleeved t-shirt. Oh, and don’t forget his favourite accessory, the butcher’s knife. We recommend getting a plastic version for obvious reasons! Good old vampires they don’t need much introduction, and no Halloween would be complete without a few of these seductive bloodsuckers floating around. Fortunately the vampire look is one of the easiest to achieve at home; to be a convincing vampire you don’t need to make too many modifications. A tight-fitting black dress is perfect for the ladies, and for the guys, some kind of smart black shirt and suit with a tuxedo. You know by now that all self-respecting vamps wear capes, so you should get yourself decked out in one of those. Once you add the dramatic makeup (even the standard makeup in your makeup bag will do), you’re well on the way to being a blood sucking pro. Lastly, you’ll want some fake blood, some fangtastic teeth and some creepy contact lenses. The ghostly bride is a great one for those who want to indulge in some creepy chic. It’s easy enough to pull off, you simply need to dress all in white and add a ghostly veil. If you can get hold of an unwanted wedding dress, perhaps from a charity shop, that could work a treat. You could also get yourself a bride costume and add the makeup to complete this sinister look. This look is easy to achieve with makeup you probably have at home; if not, you’ll only really need white powder, black eyeliner and some purple eye shadow and lipstick. Lastly, you just need to add some awesome white screen contacts. This one is even good for guys to try pulling off, what better way is there to freak people out than an undead male bride? It’s certainly novel if nothing else. Who doesn’t want to be an evil queen at least once in their life? The great thing about this type of Halloween character is that there are so many choices; one good choice might be Maleficent, with her macabre black horns, tight fitting black attire and menacing crow friend. Her make up is another easy one- white out face with bright red lippy and purple shadow; but as Maleficent demonstrates, the key to any great evil queen look is the truly evil cheek bones. Sharply contoured cheeks will complete this haunting but hot look! This tutorial shows you how to achieve it with simple makeup. 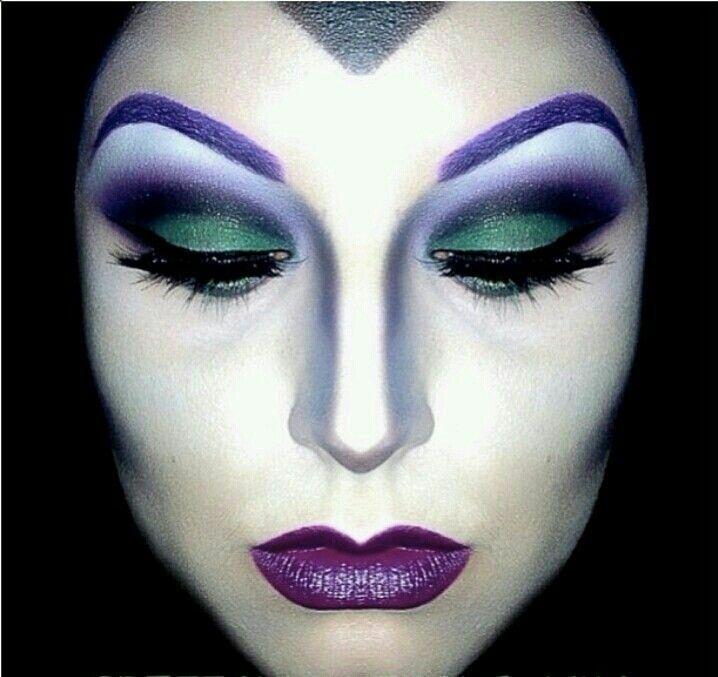 Ursula is always a popular choice at Halloween too. She gets to rule over everyone; wouldn’t it be fun to wield that kind of power for at least one night? You’ll be able to wrap your tentacles around your unsuspecting enemies throats and reign supreme above sea level. Her look is characterized by grey wispy hair, an ‘urchin-esque’ crown and a beaded bodice or tentacle adorned black dress. 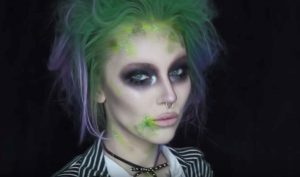 That’s ten daunting characters you have to choose from, and with these make up suggestions and tutorials there’s no reason why you can’t be the most haunting character on the scene this Halloween. We’re wishing you the most fun you can muster! Have a haunting, horror-filled (but happy) Halloween.